Bachchan's voice—the go-to guy for voice-overs since 1969—majestically looms over the historical introduction of the British coming to India with dishonest intentions and taking over the Indian provinces, one by one, until they lay their eyes on Jhansi, and face the biggest pain and obstacle as documented by Field Marshal Hugh Rose, in the form of Rani Laxmibai, a.k.a. Manikarnika, fondly called Mani. The camera then swoops to a regal looking Kanika in a teal-colored saree holding a bow and an arrow to shoot a tiger that's feeding on the livestock of villagers near Bithoor. She’s caressingly shot in slow-motion and majestically at that, almost frame-fitting Kangana in a regal Raja Ravi Verma school of painting. The shooting scene looks staged, the tiger looks fake, but Kangana's Mani looks like an applause-worthy combination of regal and real: It's then, that it should hit you, that this is going be a Kangana vehicle throughout. The speed with which she's introduced right within the first reel is another clear-cut indication of what we are about to see. Everybody knows the history of Rani Laxmibai, a Karhade Brahman brought up with all the Kshatriya warrior skills by the Peshwa of Bithoor. So, she rebels, she questions, but she marries the King of Jhansi, Gangadhar Rao. And then she questions the Rajmata and the council of ministers. She tames a wild horse unabashedly when she's being applied henna on the day of her marriage. (When asked, she says she used the occasion just to dry her henna!). This streak of rebellion is smartly used and the arc completed later in a scene when Gulam-Gaus (Danny Denzongpa) questions her seeking justice and peace from company interference through a letter—according to him, a sign of weakness akin to her husband’s—addressed to Lord Dalhousie: She says there's a time for rebellion/revolutions, and there's a time to lay low and cut through the waves, and this isn't the time for revolution just for Jhansi. And then those terrific scenes are counter-balanced with some really shabbily written ones: The scene revealing Gangadhar Rao's reason for wearing bangles; his sword-fight with Laxmibai when he's ill; and the pointless debates between a highly irritating Suresh Oberoi's Peshwa and Manikarnika; the truly moronically shot action sequence—in spirit, this is a finely thought out sequence which subverts how a woman should be dressed or introduced first to her groom's family, but execution wise, it just falls flat—of Kangana climbing onto the heads of her brothers and then the elephant's trunk. (This climbing over the elephant's back via its trunk is done-to-death now and is getting on the nerves, right from Bajirao Mastani and now to Manikarnika; poor creatures, it's always these royals using their trunks as ladders to successes.) The most disappointingly missed shot is that of a pre-build to the iconic remembrance of Laxmibai with her kid saddled onto her back: The one shot that needed melodrama in dollops, is perfunctorily dropped onto the audience with Laxmibai just riding on, unknowingly, to the soldiers, and more disappointingly, to the audience, onto the ramparts of the fort with her son saddled onto her back. Where's the thrilling build up to the scene? Of her desperately picking up her son and tying him onto her back? Where's the scene that shows her desperation and her determination? How could they goof up here? The most potent and iconic image in the history of Rani Laxmibai, then, is reduced here to a mere gesture. Of course, in the previous scene, the one truly electrifying scene in the film, shows Laxmibai taking on more than a bunch of British soldiers single-handedly, cutting them down to size in real time at the speed of lightning, with absolutely no slo-mo shots, and at the end, standing on a heap of dead bodies with blood spattered against the walls of a Kali temple: Cinematic grandeur at one of its best with fine tribute to the legend associated. The film should have been ornamented with more of such scenes, but it isn't. And then again, as always, there's the painful depiction of the British. (Come to think of it, the only film that has managed to capture the British talking a mixture of English and Hindustani, smoothly, evenly, is Lagaan, an entirely fictional story.) The audience keeps getting googly-balled between the angrez's Hindi and English: You never know when and in what context they will use English or accented-Hindi. You just hope that a day won't come when a British Officer talks in English when he is talking of relieving himself and then, coming back, launches into detailed war-strategy in Hindustani! And that's actually the case here. There are long passages in English especially between Hugh Rose and his juniors; and there's just no subtitling in Hindi! And then there are sentences that are so much broader in scope that are uttered in Hindi that anybody could understand. The battles scenes are finely shot and flip-flop between bare brutal scenes (heads being slashed like melons] and swordfights of fancy. They are done well though, and have a credence to them. 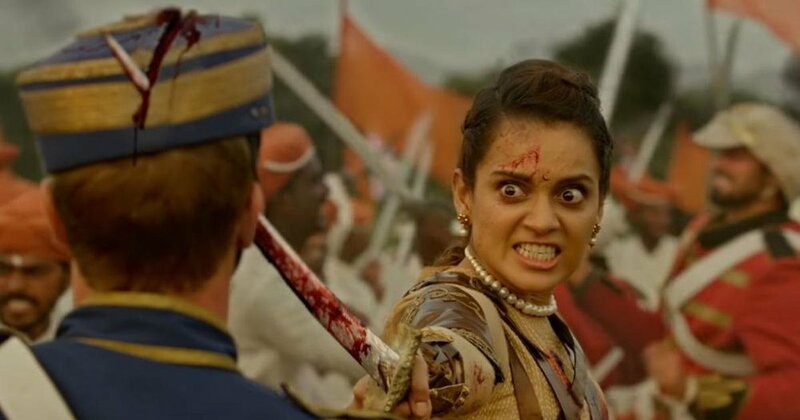 In the climactic battle, yes, it goes onto a slo-mo 300-esqe zone what with Kangana symbolically slashing the Union Jack and with long-staring camera games at the actress. It does make cinematic sense, though; it's after-all, the climactic culmination of a legend trying to be wedded onto a cinematic opera-piece. Of the actors, Suresh Oberoi and Kulbhushan Karbhanda are truly incorrigible. All that Karbhanda does is manage his constipation-afflicted dialogue delivery with a slower pacing. Suresh Oberoi is so smug and happy, one wonders whether he's playing the Peshwa without a pension or celebrating some-where-possibly-in-the-near-future Vivek Oberoi's seeming return to success. (The great Peshwa also calls the empire, 'Marathi' empire instead of 'Maratha', go figure.) Anita Lokhande is passable. Danny Denzongpa plays himself. It is Rajmata, and Sunder-Munder, though present on the screen with no longer than 4-5 minutes that are effective in their miniscule roles. And then there's the finely portrayed Tatya Tope by Atul Kulkarni, conveying the vigilance, vehemence, and dare-devilry of a true-blue warrior, chips of which are brought onto the screen at pertinent times. Mohammad Zeeshan Ayub is so ordinary, it could have been played by me with extreme make-up. Kangana, of course, channelizes her life as a film heroine sans nepotism and a small-town girl into the Laxmibai of Jhansi with fine flourish. At times, it feels this is an extension of Kangana, with all her weaknesses, her controversies, and her haughtiness, and sometimes downright idiotic statements—('I am young, we are North-Indians, and we are fair-skinned'; this on the great Karan Johar show)—extrapolating onto a historical figure in a different time-period; but then, she does surprise us with her better voice-modulated performance: The one pain-point of hers, she has worked hard on here, especially when it comes to high-pitched war-cries of 'HAR HAR MAHADEO' or her patriotic-burst on the Gwalior fort. Her eyes widen at the right time and her voice matches the thought-process going on in Lakshmibai's mind at that moment, and that's no mean achievement. And there's no doubt that she roars into form in her fiery avatar. Overall, this is definitely a good tribute to Lakshmibai, but sure as hell, could have been better. There’s Lakshmibai protecting the younger version of a cow, there’s Lakshmibai saying English is merely a skill to the Indians but not a culture, there’s Pathans joining hands with Lakshmibai and launching into ‘HAR HAR MAHADEOS.’ And then there’s Uri. And then there are the elections. A ‘colorful’ year ahead, and we’ve only just gotten started. Bhansali, Singh, Padukone and Chopra cast a spell on you. And the end result is sheer magic. The most captivated I've been with a romance for a while, which however flawed, makes the cut because of it's dazzling lead duo who leave you in awe with their range. It's seriously hard to imagine that a film that’s running gag revolves around constipation would have as much heart as this one does! Don't miss it. A suitably festive, engaging and entertaining ride that's far better than it was expected to be – go in with minimal expectations and you might, just might, be very pleasantly surprised. Ram-leela is staple Bhansali – it's excessive, it's colourful, it's witty, it's visually stunning and it's perhaps the most fun I've had at the movies for a while. Go for it! Our guest columnist, Sahil Jon, reviews one of the year's biggest releases, featuring King Khan and Deepika Padukone. Not a ground-breaking film by any means, but it's been a while since we had so much old-fashioned, escapist fun at the movies! Abbas Mustan's thriller is all style, no substance.